[Photo] False killer whale (Pseudorca crassidens). Photo: Protected Resouces Division, Southwest Fisheries Science Center, La Jolla, California. The False Killer Whale (Pseudorca crassidens) is a cetacean and one of the larger members of the oceanic dolphin family (Delphinidae). It lives in temperate and tropical waters throughout the world. As its name implies, the False Killer Whale shares characteristics with the more widely known Orca ("killer whale"). The two species look somewhat similar and, like the orca, the False Killer Whale attacks and kills other cetaceans. The False Killer Whale has not been extensively studied in the wild by scientists; much of the data about the dolphin has been derived by examining stranded animals. The species is the only member of the Pseudorca genus. This dolphin has a slender body with a dorsal fin that may be a foot high. One of the species' distinguishing characteristics is a bend and bulge (usually called the "elbow") half-way along each of the flippers. The tips of the tail fin are pointed and the middle of the tail has a distinct notch. The False Killer is uniformly coloured a dark grey to black. It grows to about 6 m long, may weigh 1,500 kg and lives for about 60 years. The False Killer Whale is a social animal, living in groups of 10???50. It is a fast and very active swimmer. It may breach or jump clear of the water and will often land on its side with a big splash. On other occasions the dive may be very graceful, leaving very little wake at all. It will readily approach boats and bow- and wake-ride. It may also emerge from the water head held high upwards and with the mouth open, revealing some of its 44 teeth. 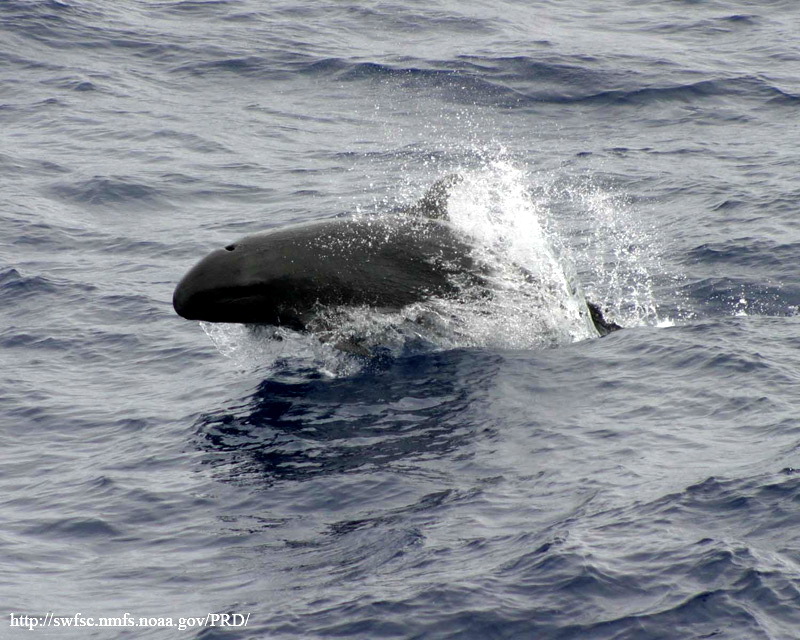 Although not often seen at sea, the False Killer Whale appears to have a widespread, if rare, distribution in temperate and tropical oceanic waters. They have been sighted in fairly shallow waters such as the Mediterranean Sea and Red Sea as well as the Atlantic Ocean (from Scotland to Argentina), the Indian Ocean (in coastal regions) and the Pacific Ocean (from the Sea of Japan to New Zealand and the tropical area of the eastern side). The total population is unknown. The eastern Pacific was estimated to have in excess of 40,000 individuals and is probably the home of the largest grouping. The false killer whale and a dolphin have mated in captivity and produced a fertile child. This is apparently the first mating between two different species that has produced fertile offspring, i.e., without postzygotic barriers. This offspring is called a 'Wolphin'. The False Killer Whale has been hunted, but not extensively, in the West Indies and Indonesia. In Japan, a small number of these cetaceans are killed every year. False Killers have long caused anger amongst fishermen fishing for tuna and yellowtail. The dolphins take the fish from the longlines used by the fishermen. This led to a concerted effort from Japanese fisherman working from Iki Island to deplete the species in the area - 900 individuals were killed for this purpose between 1965 and 1990. On 2nd June 2005 up to 140 (estimates vary) False Killers were beached at Geographe Bay, Western Australia. The main pod, which had been split into four separate strandings along the length of the coast, was successfully moved back to sea with only one death after the intervention of 1,500 volunteers coordinated by the Department of Conservation and Land Management.